Firefighters from the S.C. Forestry Commission, area volunteer fire departments and the Clemson Experimental Forest were dealing Wednesday with a wildfire on Pinnacle Mountain near Table Rock State Park in northern Pickens County. The fire was started accidentally by a campfire near the Foothills Trail. 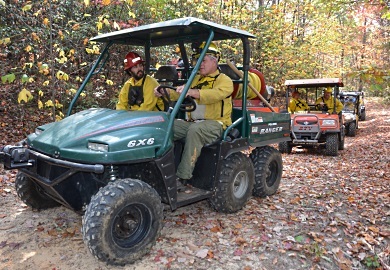 "We are scrambling around getting signs out and checking trails and getting people out of the way in case this fire on Pinnacle Mountain is not contained," said Mark Hall, land manager for the Jocassee Gorges area for the S.C. Department of Natural Resources (SCDNR).